While you can always do things on your own to improve your health such as diet and exercise, that’s not going to solve a problem like arthritis in your wrists. 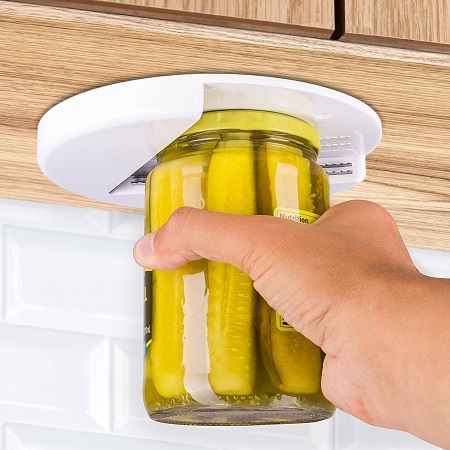 If you struggle with this and want to have a little more independence in the kitchen, the OxGord Stainless Steel Arthritis Jar Opener will help you with pickles, jams, honey, and any other items that come in a jar and need a little ‘oomph’ to be opened. Since it has a wide mouth that comes to a narrow point, it can also be used for anything with a twist top, meaning nail polish and bottles of juice or soda will be easier to handle. For those who are suffering from arthritis, fibromyalgia, or joint pain, this will mean less frustration and spills from overexertion. Those with children could use this to let their kids tackle jobs that might otherwise be too difficult for them. This is only going to cost you around $10 for a 2-pack, and is easy to install with a peel and stick backing that should be put wherever is most to convenient to its user.